Volia Review 2019: Is Volia a Good Hosting? Volia offers 99.98% uptime and 24/7 dedicated support. Their servers are housed in Ukraine, offering access to Europe at a lower entry price than what you would pay in Western Europe. 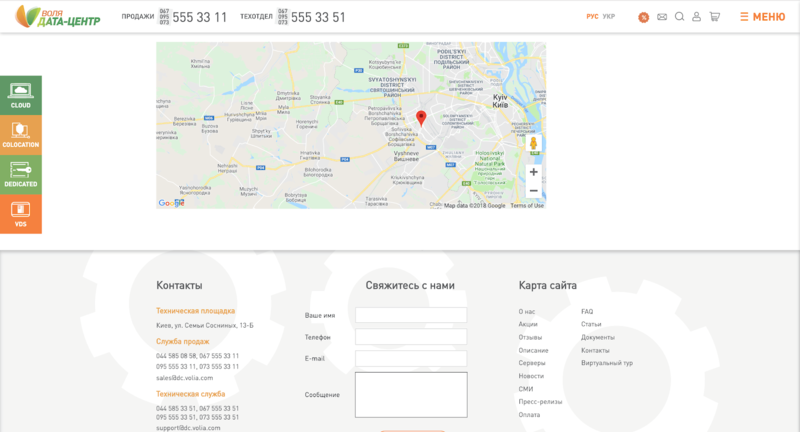 Volia is a web hosting company based in Ukraine and has been offering Ukrainian language interfacing and support since 2006. Their clients include several larger businesses such as InfoCar, APS Solutions, and RST.ua. Volia offers cloud, dedicated, VDS, and colocation services out of their data center in Ukraine. Besides offering better proximity to Western Europe, Volia is well able to handle clients of all sizes. All of their servers are housed in a 20-floor business center with enough capacity to hold 30 million hours of music. This is backed up by the fact they offer up to 5,000 GB of SATA disk space and 100 GB of RAM with their cloud hosting service. Further, Volia offers a seven day trial period and an average of 99.98% uptime on all of their plans. They also offer virtualization software and services through VMware. Their plans include SATA and SAS drives along with MySQL support, but does not specify a version for the latter. In addition, the vendor does not make any reference to PHP capabilities or SSL certificates. On top of that, Volia does not offer protection against DDoS attacks. Instead, the company reserves the right to take as many as three days to fix any problems or failures that occur with their data center. It’s not clear if they will take any proactive measures to keep your website online during that time. Overall, while they do seem to have high-quality servers, it appears that you’ll need quite a bit of tech-savviness to maintain your servers with this provider. Every plan Volia offers comes with a free seven day trial and is fully customizable. Unlike the industry standard that bundles together a fixed amount of storage, memory, and bandwidth, here you can freely mix and match capacities to meet your specific needs. You’ll never have to pay for something you won’t use. Their entry-level plan comes with 50GB of storage and 2GB of memory, which is a bit odd because most websites that need that much storage will want more memory than that. However, some beginning webmasters might find this attractive if they are running a simple website that holds a lot of files. The price-to-value ratio for performance upgrades is excellent. You can get a 50x increase in RAM for just a 33% increase in price, or a 100x increase in storage for a 66% increase in price. Where you may run into a problem is the 100Mbps ethernet port, which will be inadequate for webmasters running large e-commerce websites. An upgrade to a 1GB port is available, but costs five times the amount of the entry-level plan. Considering that if you need the additional speed, you’ll also need to upgrade from the entry-level performance standards, the price for webmasters running sophisticated websites will offer less relative value to other European options than the entry-level price suggests. Support is adequate. Email and native on-site ticket support are available and can answer your basic questions, but take at least a day to respond. You can reach a representative 24/7 via phone, but other options are thin. There is no on-site live chat, and while Facebook chat and email service is available, it can take several hours to get a response. There is also no self-help knowledge base. Volia offers web hosting with fully customizable capacities that can be large enough for websites of all sizes. The price point is not as advantageous as it could be, but webmasters more comfortable operating in Russian or Ukrainian will find this an option to get a good level of performance. Wondering how Volia stacks up against other Web Hosting companies? Enter any other Web Hosting company and we will give you a side-by-side comparison.